Faced with a tough challenge, Aggregate Industries rose up to the challenge and developed a new highly sustainable product that could perform to the high standards of road use. 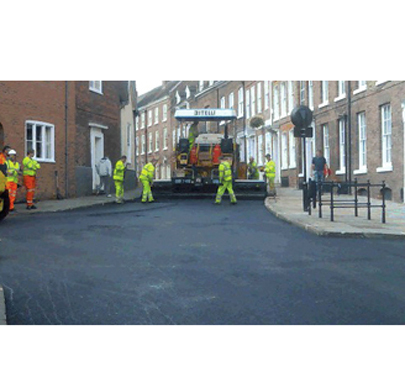 Shropshire Council was looking for an environmental asphalt that could be used in a base, binder and importantly a surface course layer with a 125 pen. Aggregate Industries - Asphaltdeveloped a Life mix using half warm mix technology that is not only revolutionary in the UK but also radical in terms of carbon footprint savings. The 10mm close-graded asphalt demonstrated hot mix equivalence in terms of deformation resistance, stiffness and compactability but was produced and laid at a lower temperature. The embodied energy saving of the product supplied is the equivalent of 13,130 miles in an average car or taking one car off the road based upon an average mileage of 12,000 miles per year. Produced at our Haughmond Hill plant, approximately 130 tonnes of Life 10mm close-graded surface course 100/150 was delivered to St Johns Hill in Shrewsbury. The asphalt was produced at temperatures between 95-100C and laid at 70-85C. This meant that the light oils in the mix never reached boiling point (140C), allowing them to keep their structural integrity and reduce the binder aging process. Aggregate Industries not only met the clients sustainability agenda but also importantly satisfied material engineering criteria for durability and performance.